I imagine Stephen Steinberg astride a muscular white horse, whip in one hand, pistol in the other, riding to scourge the American left of its racial amnesia. Or he's a biblical prophet, imbued with the divine spirit and setting the highest standards for the community. Sometimes the need for such a seer is self-evident, and sometimes Steinberg fairly meets it. Sometimes. His The Ethnic Myth: Race, Ethnicity, and Class in America is a powerful effort to say some meaningful and needed things about race relations. 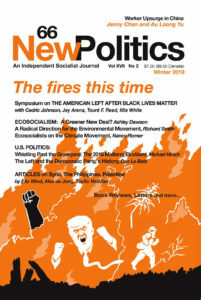 His essay on Nathan Glazer in an earlier New Politics, which I edited with a great deal of pleasure and agreement, is required reading if you want to understand the interstices of race and politics after World War II and the role accommodating critics of remedial efforts played in housebreaking American left liberalism. Even when he gets it wrong — as I think he does in this essay — you can't help learning from Steinberg. Still, there's a uneasy line between the prophet and the scold, and Steinberg crosses that line like the town drunk. Like the heiress who can't be too rich or too thin, Stephen Steinberg writes as if you can't be too anti-racist, at least when it comes to crimes against African Americans. Because for every powerful statement Steinberg makes about United States racism as structured and how the fight against inequality is a battle with an anticorporate class dynamic at its heart, there's a niggling moralism attached, one that threatens to reduce political and economic relations to mere objects of shame. Now, shame may be, as Marx said, a revolutionary sentiment, but Steinberg writes as if it's first among equals. He writes less as the interpreter of the situation — how Sartre described Frantz Fanon and how I expect he sees himself — and more as its progenitor. Steinberg is also a gifted polemist. That's no crime on the left; it's only a felony when adopting an attitude isn't braced by intelligence, and Steinberg can make powerful points intelligently. His demand that immigration policy be looked at critically is compelling. Whether the nation's borders are porous or hermetically sealed represent policy choices in which someone gains and someone loses. Open borders are not in themselves good, and cutthroat competition that drags down wages is an undeniable evil that can be eradicated through rigorous union organizing, new labor policies and — yes — an eye to shaking up the federal immigration guidelines, Steinberg's preferred cure- all. But then he overpersonalizes. He fingerpoints. Even his Glazer essay, like his earlier critique of William Julius Wilson,* left me feeling he exaggerated the importance of Glazer's apostasy. Certainly he doesn't prove that Glazer and company's chatter mattered. Steinberg also has a tendency, as at least one critic observed, to caricature or flatten an opponent's argument by reducing it not to its essentials but to his. He's not alone to do so, but it's surely a bad habit. When he writes "immigrants are implicated in America's race problem through the very act of immigration . . . they also acquire some heavy baggage: moral and political responsibility for the vestiges of slavery," that language is incendiary without necessarily burning anything that ought to be torched. His caveat, that he is "not calling into question the rights of immigrants" is cold comfort. The immigrant bashers could do it for him. Or when he writes, " mass immigration has exacerbated the problems of African Americans. Even if this is an accident of history — a silent conflict on a gigantic scale — it implicates immigrants in America's race problem, " this is more guilt by association. And while he gives lip service to the values that newcomers bring with them, such a sensibility doesn't suffuse his essay. Not as does the sense of a zero-sum immigrant menace. I wish he'd acknowledge flat out what immigrants contribute, as well. In Jasmine, for example, the novelist Bharati Mukherjee has her South Asian immigrant heroine offering her Iowan husband the trilogy of Brahma, Vishnu and Shiva in return for St. Louis Cardinals baseball godheads Musial, Brock and Gibson. That's the beginning of a fair trade, I think. Let me raise some problems with Steve's piece that go beyond tone or name-calling to a discussion of socialist politics. my challenge is to think about immigration from the standpoint of this black figure, crouched on the ground as others pluck fruit off the tree of opportunity. Dare we also read the immigration literature, the celebratory narratives of immigrant progress and triumph against adversity, from the point of view of "the man farthest down," to borrow a phrase from Booker T. Washington?. . . and that doing so is an intellectual and moral imperative. That could be a good heuristic exercise. But is doing so an intellectual and moral imperative? Is it even appropriate, except as ethnography or anthropology to organize evidence and view things from the point of view of "the man farthest down"? Yes, Steinberg admits in the ellipsed section that "It goes without saying that this is only one among many standpoints for thinking about immigration and immigration policy. My only contention is that it is one that must be considered." Here it is the only one he adopts. It's a change of pace from the view of a common- sense driven common good — something which is rarely common and never good — but it's dangerously parochial. What does the man farthest down want? To be less far down, and by any means necessary! Without our being schematic or unfeeling or pre-Cambrian about American racism, there are pitfalls to internalizing anything that's not taken from a class point of view. Yes, it's crucial to think broadly and nondogmatically. The university- centered left probably has a better understanding of "the ladies who lunch" and the Fortune 500 CEOs who power lunch than it does the perspective of those who barely eat one meal a day. It's necessary to speak for the victims and work alongside the victims. It's a sacrament to teach children that what privileges they inherit are an accident of birth and that the greatest sin is class pride. But it is a disaster for socialists to adopt a point of view that isn't class based. Positing an inherent contradiction between African Americans and immigrants is playing some other class's tune. Immigration is the most important single factor in dispelling this "mystery." The North was able to satisfy its insatiable need for cheap labor through the immigration of some 25 million Europeans between 1880 and 1924. Blacks, on the other hand, were categorically excluded from the entire industrial sector, except for a few menial, dangerous, or backbreaking jobs that immigrants spurned. Note that the culprits in this drama were not Southern sheriffs and lynch mobs. Nor does blame go only to greedy capitalists who played one group off against the other. Workers, including workers of immigrant stock, through their unions engaged in a combination of ethnic nepotism and blatant racism that reinforced black exclusion. In effect, the industrial revolution in the United States was "for whites only." Yes and no. Nineteenth century craft unions were racially exclusionary, and the union label got its start in the West Coast cigar factories to signify their product was not Chinese- or Japanese-made, but produced by union — read "white" — labor. In fact, if anyone is to blame in the period Steinberg cites, it was the previous generation of immigrants — those largely Americanized — who now hogged the best jobs. So, in the coal fields and steel mills, for example, Irish workers succeeded Germans and Scots in holding craft jobs, while succeeding waves of immigrants fought to enter these trades. Ethnic succession did go on, with the unions backing the earlier immigrant members. The bigger question Steinberg does not answer is that if bloody battles over ethnic succession were the rule, then why were African Americans never in the fight? Immigration won't explain it. The proof that European immigration was devastating to blacks is that as soon as immigration was cut off by the First World War, it triggered a massive migration of blacks to cities in the North and West, resulting in the most significant economic advance since the abolition of slavery. That's not proof. What triggered the migration was a push-pull factor, and Steinberg leaves out the push and half of the pull. The mechanization of agriculture devastated small farmers and sharecroppers. Falling crop prices and competition between white and black agrarian workers made a bad situation untenable. But it did allow blacks to leave the black-belt South, something they were prohibited from doing before. Add to that the peculiar boom economics in northern cities leading up to U.S. entry into the WWI and migration was inevitable. As to the New Republic's observation about immigrant/black competition for jobs being "a silent conflict on a gigantic scale," (and forget whether it was indeed silent), how is this any different from the observations organized labor made about all new immigrants, not just Asians? It was Gompers who said in his autobiography, that "immigration is, in its fundamental aspects, a labor problem." If there is a consistent theme in craft union ideology and practice, it is a desire to keep wages high through capping the labor supply by keeping newcomers out. How were blacks' positions structurally different? Steve even blames modern, post-1965 immigration for the "missed opportunity to integrate blacks into the economic mainstream." What would be the preconditions for grasping that opportunity? I can think of two, neither of which were operational. One, a socialist labor movement committed to unifying the class and militating for full employment and equality in hiring. Or two, a chauvinist administration that closed the U.S. borders. And how well would U.S. blacks have fared in the ideological context in which foreign workers were stigmatized, restricted or exiled? Although it is often argued that blacks arrived at a time when the industries that had provided opportunity to earlier immigrants were in decline, the fact is that millions of new immigrants were rapidly absorbed into both the residual blue-collar sector and the expanding service industries." I wish he made more of the argument. Because for the last two generations, it was what the Right calls "entrepreneurial minorities," or at least those with skills and the capital to form niche businesses, whom the immigration laws favored. It's not just a white blind spot that valorized so-called "immigrant virtues" while native blacks' skills were belittled; it's an objective question of whether the two populations are comparable. If they are, Steinberg should say so. He might have a case in tracking immigration from Ireland, where minimally-skilled young Irish men and women got jobs closed to ghetto blacks. But what jobs did unskilled blacks compete over with south Asians or Eastern Europeans? He should also at least acknowledge the gains blacks made in the 1970s, before the wave of deindustrialization slammed black families the way the depression had. In the steel industry by the mid-1970s, high paying production jobs in such areas as Cleveland, Buffalo, Baltimore, Chicago, and Northwest Indiana were sizeably held by black men and a growing number of black women. The high-paid industrial proletariat in heavy industry was increasingly African-American, out of all proportion to its size in the general population. Doors to the crafts were creaking open, in part because of OEO affirmative action watch dogging. New immigrants in the mills — chiefly east Europeans (Serbs, Croats, Albanians, etc) — confronted strict fair-hiring seniority rules, meaning there was no way they could hold the better jobs. Employers still used divide-and-rule tactics for political gain, such as Chrysler's hiring Middle Eastern immigrants as a buffer against militant black workers' demands. The tragedy of deindustrialization is that the closing of the mills liquidated this generation of well-paid black breadwinners and the shop-floor leadership that was emerging. Yet whether through steel industry collapse or auto industry downsizing, jobs were being wiped out. No chance for African-American hiring if downsizing and then off shoring became industry watchwords, and no reason to blame immigrants. Steinberg even calls post-1965 immigration "a conservative policy in liberal garb." Can he name an ostensibly progressive federal policy that isn't fundamentally conservative, in the sense of maintaining social order and class peace, no matter how it is dressed? Social Security? OSHA? The Wagner Act? Conversely, an anti-immigrant stance would not have been ipso facto a "liberal policy in conservative garb." There would be nothing liberal about closed borders, broken families, an alien witch-hunt and the stench of xenophobic ideology that would accompany such policies. Corporate choices were, as always, to either import labor or export jobs. Had the U.S. done what Steinberg urges, outsourcing of U.S. products and services would have happened that much sooner. A harbinger was the collapse of the U.S. maritime fleet by the end of the Vietnam War. Think Liberian flag ships. Think Aristotle Onassis. Think also about the mechanization and containerization that did away with the longshore industry. Today, New York is in competition with Baltimore, Newport News, and Montreal for the East Coast container super-port title. Immigration was not a factor in closing the ports, though racial hiring by the mobbed up Longshore union kept restricted much of the remaining jobs. If immigration had remained at the level that existed in 1965, at 292,000 immigrants annually, compared to over one million last year (then) clearly, the tight labor markets would have provided incentives for employers to lower their racist barriers, to hire and train black workers, and if necessary to improve wages and conditions to make even these marginal jobs attractive to native workers. There's nothing "clear" about it. Would "tight labor markets" alone provide incentives to lower racial barriers? Possibly. Would it improve wages and conditions? Not necessarily. It would have taken anti- capital-flight legislation in addition to closed labor markets to do that, and there was no political context for raising, let alone winning, that demand. Not with both Democratic and Republican administrations facilitating capital flight even as they were opening immigration doors. The accuracy of employer claims — that blacks are less reliable and efficient worker — are never subjected to critical scrutiny, much less put to an empirical test . . . .We never get to hear the experiences and viewpoint of these black workers: what their qualifications are for the job, what their job experiences are, how they are treated by their white bosses, how they are treated by immigrant coworkers and how they regard them in return. In other words, we never hear from the man farthest down, who is not only crouched on the ground but also silenced. I strayed from the academic groves twice, most recently 20 years ago, so I can't quote chapter and verse, but I can certainly believe the sociological literature is that thin. Still it would be useful if Steinberg had scanned the literature — even in passing. He cannot be the only nonracialist left standing. I leave it to other readers whether his call to action is doable. Most of his policy recommendations are desirable in part, and most express politics a socialist can and should support, though I would add an emphasis on guaranteeing union organizing rights and on restricting offshoring. But movements are not built or many moved to solidarize through moral calls to do the right thing, a principle with which Steinberg seems to cohabit. That's not how I read what motivated participation in the civil rights movement, or mobilization for any movements anywhere. A political program, especially one claiming to be radical, has to be concerned more with linking the present to a tangible future than with making the grand gesture. Yet with so many voices demanding ugly things today, a little of Steinberg's teary, bug-eyed humanity can only help. * Full disclosure. I studied with Wilson at the University of Chicago some two decades ago. He was a dedicated teacher and a dear friend. I also had my political differences with him, which is illustrated by the comment he made to me that he, too, was a socialist, and an ecumenical one, being equally comfortable with Bayard Rustin's SDUSA and Michael Harrington's DSOC. I was not impressed by the breadth of his vision, as I still considered myself more of a Hal Draper-Tony Cliff acolyte. But Wilson did not deserve Steinberg's comment in "The Liberal Retreat From Race" (New Politics, Summer 1994] that the founding father of neocon public policy, Daniel Patrick Moynihan "was reincarnated 15 years later in the form of William Julius Wilson." Ironically, it was Wilson who introduced me to Steinberg's work, a book which was required reading for the sociology exams. MICHAEL HIRSCH is a member of the New Politics editorial board. A quondam sociologist and steelworker, he works as a labor journalist in New York.